Do you want to visit us in the summer? Well, come on down! But can you keep a little local secret? 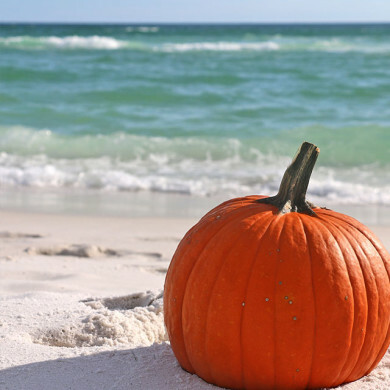 Fall is one of the best times of year in Fort Walton Beach, Florida. As the temperatures drop, things really heat up along the Gulf Coast. We just can’t help but be in a good mood when the humidity takes a hike, and the crowds fall away. So even if you love us in the summertime, come back in autumn when it’s cooler and quieter. The weather’s not what all the fuss is about, either. This time of year brings an ever-rotating calendar of events that will keep you entertained throughout your visit. Here’s a look at fun fall festivals you can enjoy while you’re here. For more information check out the Fort Walton Beach Chamber of Commerce Website. Destin Seafood Festival: Held the first weekend in October, this celebration of the finest foods out of local waters is set in beautiful Destin Harbor. Destin Fishing Rodeo: A month-long fishing tournament that got its start in 1948. Dog Daze: An annual celebration of dogs and the families that love them. Mattie Kelly Festival of the Arts: A juried art show with live music, food and children’s activities. Art Walk on the Harbor: A monthly celebration of art and music along the Destin Harbor. Baytowne Wharf Beer Festival: More than 200 domestic and international craft beers in a charming setting. Panhandle RV Show: A seasonal showcase of RVs at the Emerald Coast Convention Center. GulfScarium’s Splash-or-Treat Spooktacular: Kids in costume get free admission to the Marine Adventure Park. Halloween Haunt at Destin Commons: Trick-or-Treat and check out the Haunted House at this popular outdoor shopping and entertainment complex. Vettes at the Village: Area Corvette Clubs bring “America’s Sports Car” to the Village of Baytowne Wharf. Blues, Brews & BBQ: Area restaurants cook up their best BBQ for a spirited competition at HarborWalk Village. Gulf Coast Wedding Expo: Planning a wedding? Head to the Emerald Coast Convention Center to meet vendors and get great ideas. Snowbirds Season Kick-Off: Learn why you should spend your winters in the Sunshine State. Santa’s Big Bang Arrival: Destin Commons and Bass Pro Shops welcome you for art projects, a holiday parade and the lighting of a spectacular 50-foot Christmas tree! Festival of Trees: Check out 12 unique Christmas trees decorated by area non-profits.